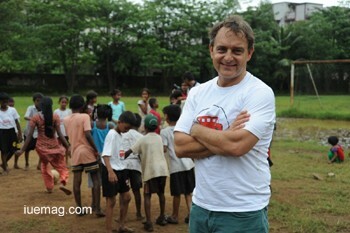 Matthew Spacie had initially volunteered with Mother Teresa's organization in Kolkata when he was just out of college. Then he was Cox and Kings' COO in India and then co-founded Cleartrip, India’s largest online travel agency. Being so close to India, this country held a deep place in his heart. “As part of my job, I tried to look for a way to work on what appeared to me as a very stark need in the lives of children in India. Eventually, the answer came to me naturally. As part of the Indian Rugby team, we used to practise at Mumbai’s Azad Maidan. Street children from the Fashion Street would watch us, and one day I invited them to join in for a game. And just like that, the idea of Magic Bus was born,” narrates Mr. Spacie. The lesson Matthew learnt while being a part of India’s National Rugby Team was that compared to other approaches in children’s development, using sports and activities was perhaps far more impactful, which they later used to develop and grow what has today become the Magic Bus sport for developmental approach. The approach of Magic Bus’ turning lives works best over the long-term as they work with children in the 6-18 age range, and address their developmental needs at each stage of childhood. This way, by the time they are 18 years of age, they have received all the inputs such as how to practise healthy habits, develop confidence and be job-ready. Magic Bus has grown from an organization that focuses on the sport for development approach alone to one that is equally invested in making youth ready for jobs or higher education. “A very important addition is our youth development model focuses on connecting youth to opportunities available in the market,” mentions Matthew. “Over the next 3 years, we are working on making sure that at least 1 million children in India have access to the award-winning Magic Bus approach to create lasting change in their lives and move away from poverty,” says Mr. Spacie. The Magic Bus team works with all categories of children living in poverty, whether they live in urban slums or villages. The main focus is on giving every child a holistic support by way of a mentor who is present in his or her life and acts as the more knowledgeable other, an elder who can guide, teach and counsel as required. “We work with parents and community elders so that not just children themselves but the community around them also becomes more children’s development-centric,” mentions Matthew. The approach used – sport for development – precludes children and youth from dropping out of the program. This makes sure that they are continuously engaged with Magic Bus over a long period of time and can change their behaviour to become fully participative citizens of their country. “One of the major impact areas that the curriculum teaches children on our programme is how to stay healthy by preventing common diseases. And to the community, it spreads much-needed awareness about issues such as sanitation and hygiene, which is a major challenge in Indian slums and villages,” says Mr. Spacie on health issues covered under Magic Bus model. According to Matthew, the most challenging situation was in overcoming potential supporters' questions about the impact of their approach. Matthew and his team took this as a constructive feedback and have worked very hard over the last 2 years in measuring impact in the key areas the programme works on: promoting education and healthy behaviour, developing a perspective around gender equity, and teaching essential skills such as teamwork that will help when the child is ready to look for work. “There is a certain excitement to being brave enough to be different, and at Magic Bus, this feeling keeps us connected to our work everyday,” he smiles. “One of my most memorable moments was watching the London Olympics with a Magic Bus child by name Gulafsha Ansari – she won an international contest to win this trip to London, which really was incredible!” exclaimed Matthew. This child has grown up in a neighbourhood like Dharavi, who develops the drive and confidence to take part in and win a global contest. Her idea was to be able to run weekly football training sessions for her friends in her neighbourhood, overcoming all the naysayers who told her that girls had no business wearing shorts and playing! “Each and every person, given the right opportunity, has the potential to grow. The dreams that children have in the cities today are exactly the same – whether they are growing up in an under-privileged household or a family like yours and mine. With some crucial support, even a very poor child can work his or her way out of poverty,” was Magic Bus’ inspiring message. Any facts, figures or references stated here are made by the author & don't reflect the endorsement of iU at all times unless otherwise drafted by official staff at iU. This article was first published here on 2nd January 2015.